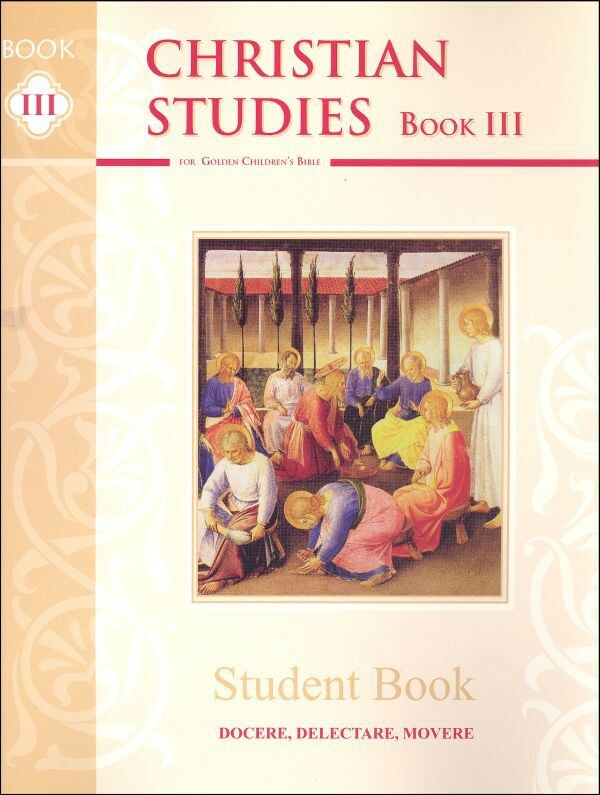 Christian Studies Book 3 Student Book. This three-year series thoughtfully guides your child through the Golden Childrens Bible, teaching him the fundamentals of Bible stories, history, and geography, with solid detail at a manageable pace. Students do not merely skim the surface. They embark on a three-year Bible reading course that builds faith by teaching Salvation History as real history. Christian Studies Book 3 Student Book. This three-year series thoughtfully guides your child through the Golden Childrens Bible, teaching him the fundamentals of Bible stories, history, and geography, with solid detail at a manageable pace. Students do not merely skim the surface. They embark on a three-year Bible reading course that builds faith by teaching Salvation History as real history. Each Student Book offers 30 lessons, and each lesson is comprised of a scripture memory passage, important facts to know (including people, places, dates, and events), vocabulary, and comprehension questions that draw out the golden nuggets of meaning in each story. Maps, timelines, activities, and discussion questions offer the critical integration that is central to classical education. The Christian Studies program is in chronological order with the Bible. It is not ordered by student age, and each book is appropriate for students in 3rd through 7th Grade. (Many students start Book I in 3rd Grade and finish Book III in 5th Grade.) From Memoria Press.